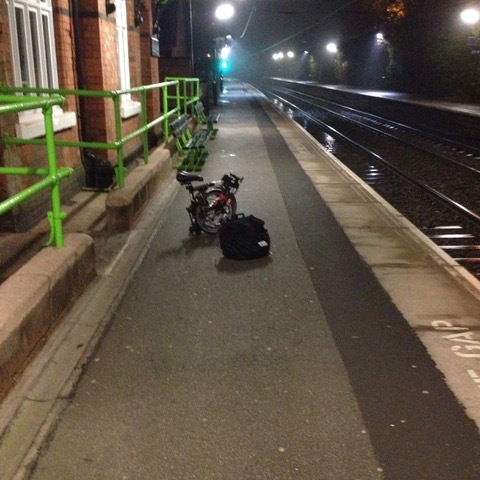 Recently a group of us took a London Midland train with one folding Brompton and two mountain bikes from New Street to the little station at Dudley Port. There we met up with George Reeves, the Cycling UK representative in Sandwell, and Beverley Nielsen, the Lib Dem West Midlands Mayoral Candidate (who drove up from Worcestershire). We wanted to explore the potential of a proper tourist cycle/walking route down the Tame Valley. London Midland are relaxed about the two bikes per train rule on a quiet Sunday and it was really useful to do a one way trip like this. It was a good ride, guided by Roy and George, with two Country Parks, various link ups, some steep steps under the M5 then green routes and canal tow paths back to Birmingham via the underworld of Spaghetti Junction! Fortunately we didn't know about the WW2 bomb at the time. Being able to take a bike on a train for commuting or leisure trips is a real boon but not all companies are as tolerant as London Midland. On many services like Virgin you have to book in advance and the very limited spaces can already be taken. This is no good for getting home if you have a change of plan, a mechanical problem or one of your group or family is just too tired to continue. When trains had guard vans I used to take my full size Dawes Galaxy down to London but for many years now, I have used a Brompton folding bike on Inter-City trains. This suits me very well but it is an expensive investment (though in Birmingham and some other cities you can hire one), and it places some limits on the type of riding you can do at the other end. A few years ago, I combined a meeting in Manchester with a two day tour of the Yorkshire Dales with my Brompton, catching six different trains with no advance booking. I have represented Cycling UK twice at the annual Cycle Rail Awards ceremony organised by the Rail Delivery Group. It is a good event but most of the Awards are about the rail companies preferred approach to multi-modal travel - secure cycle parking at stations, cycle hire, hubs providing sales and maintenance etc. All excellent and cutting down on car journeys and car parking but nevertheless we often want the bike at both ends of our rail journey. Many London commuters have a bike locked up at both ends of their trip. Cycling to the station, securely storing the bike and then walking from the destination station to the "office" works well for may workers. But others, and I have met them often on early Birmingham Cross City line trains, need the bike at both ends of the journey and sometimes have to change trains and cycle between stations. For shift workers, site workers and anyone who needs the flexibility and efficiency of cycle commuting to changing workplaces, being able to make hybrid rail/cycle journeys is vital. When I suggested an award for actually carrying a bike on a train as is done in many countries and parts of the UK, I was told that this wouldn't be a good idea because not all rail companies can manage on board cycles - it is a no no on busy overcrowded London commuter routes especially during the rush hour for example (though in big cities on the continent bikes can be taken even on underground services). More Space for Cycles on trains would be a significant improvement and encourage less car use and more active travel, whether to support a more flexible labour market or to encourage the leisure and tourist economy. If you visit any suburban street, car park or indeed car showroom you will see bike racks on cars. Too often you have to run a car to get the most out of your cycling, especially family cycling. This doesn't help congestion or the environment and usually means a ride that returns to a car park, losing the flexibility that makes exploring by train and bike such fun. But if you want to plan a cycle rail adventure of your own with friends or family, Plus Bike is a handy guide to current regulations and booking requirements. Using trains you can explore so many beautiful or interesting parts of the country without having to be a dedicated long distance rider and you can ride from one station to another. I have a lovely little booklet called Quiet 'Wind Assisted' Cycle Routes Between B.R. Stations lovingly curated by R.N. Hutchins et al in 1993 and "devised for elderly people and their families". Unfortunately this was before the Internet and I don't think it has been updated. By researching prevailing winds and quiet tracks and roads, Richard Hutchins and his collaborators covered the whole of the UK with a tantalising array of routes. This was later updated as Easy Cycling in Britain by Michael Z Brooke and Richard Hutchins in 1995, but a quick Google search suggests that it is no longer in print - a pity. However, you may find a second-hand copy by searching on AbeBooks.